I’ve managed to work up a few more stitches on Breath of Spring, which is really turning out to be a super-fun project! Here are some photos of progress and plans! When I last posted photos for this project called “Breath of Spring,” I hadn’t quite finished the French knot flowers that look like butter mints. But I finished those up late last night, and you know what? I really like them!! The little blue forget-me-nots stand out a lot more than I realized they would. I’m not quite so keen on the really dark undersides of the foxglove (the bell-shaped purple and yellow flowers on the left), because they Really seem to stand out. But … I still like them! This is my favorite section so far – I like the butter mint flowers and the angelica (the other “white” French knot flower burst on the right of the photo). 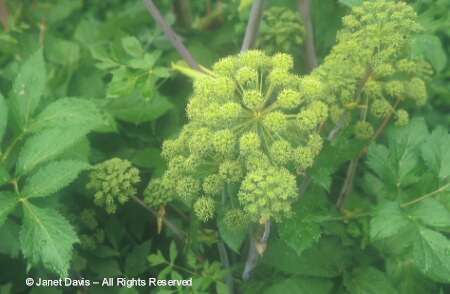 Over all, the angelica looks white, but you can see that it, too, is worked in a variegated thread of pastel colors. I’m glad – if they really were white, they’d be too stark. I like the subtle shades of color. A new ladybug – I like this one better than the first, but he’s got a little antenna thing going on there, like the tip decided to disconnect. Funny, it took an up-close photo to make this clear. I didn’t notice it until I saw the picture! Here are the “butter mint” flowers. I don’t know what else to call them, because I don’t know what they’re supposed to be! They are worked in slightly darker shades of pastel than the angelica. I like them, after all. I didn’t think I would, but I really do! 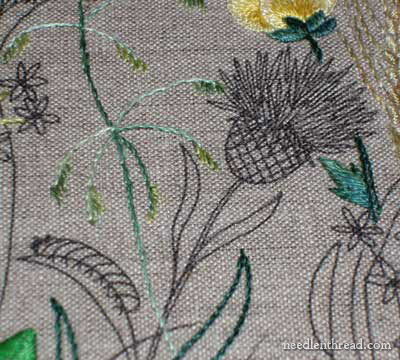 And this is where I’m going next – the thistle and the caterpillar. I can’t wait! That thistle looks fun. And then, after that, the grasshoper. I’m kind of getting into this bug thing. 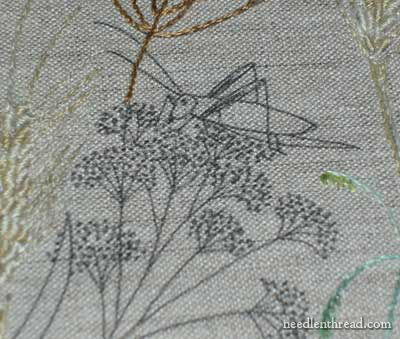 Embroidering bugs is great fun. Kind of weird, but really fun. 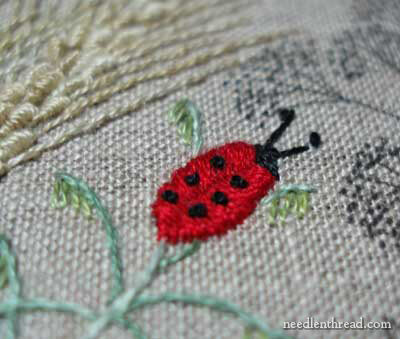 “I’m going to go embroider a bug, if you’ll excuse me.” Not something you say every day, you know? So that’s my progress so far. I can’t tell you how wonderful it is to be able to sit down later in the evening, after long days at work, and just stitch for a half an hour or so before going to bed. It’s great relaxation. I’m so thankful to have stitching as a hobby, aren’t you? It’s just… the Best! You can’t help but smile, seeing this piece! I can’t wait to see the grasshopper finished! You know, that’s an invaluable piece of information you’ve offered to a novice embroiderer, Mary; about how plain white thread would have made the angelica flowers look stark and that the variegated soft pastels still offer an overall impression of white. I just know I would have used a bright white thread, which would not bring those flowers to life nearly so well! Mary, this really is a lovely project. 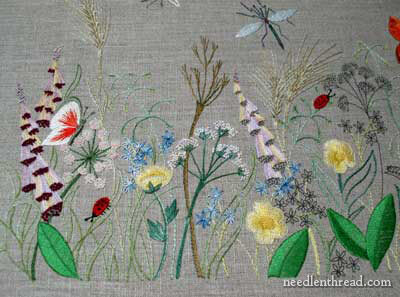 It makes me want to go embroider a garden right now! I just might… Since I’m into stumpwork currently, maybe I’ll look at my garden photos and see what I can come up with. North Carolina bugs and flowers are really interesting – especially the bugs! 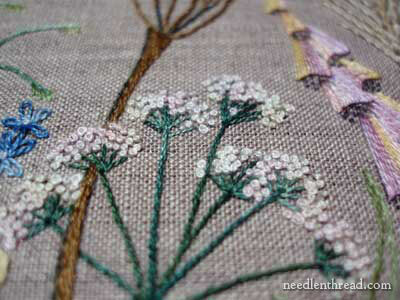 Hello Mary, I love your Blog as I am just getting re-acquainted with embroidery. Could the buttermint flower be Queen Anne’s Lace? I have a suggestion for the antenna, try a pistol stitch. I didn’t think this would be my sort of piece – but it’s gorgeous! This is beautiful. I love the flowers and I think you’re right that pure white would have been not quite what it needed. I agree with Lesley that those flowers just might be Queen Anne’s Lace. Doesn’t look quite like buttermints, does it? Iam often surprised when everyone other than me seem to be able to identify different flowers with their names. I think Iam flowerblind!!! Deepa, I think they’re very similar, but I don’t think Angelica and Queen Anne’s Lace are exactly the same thing. Not as far as I can tell. I love the buttermint flowers and the way the colour changes thoughout them. 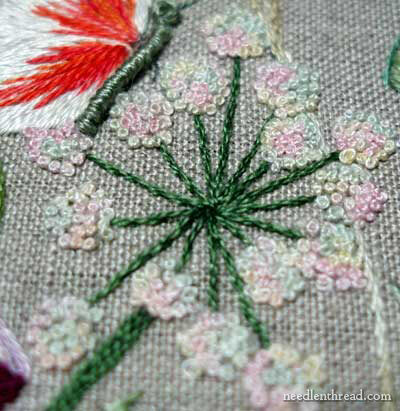 I also love the way that you are bringing the breath of spring together one stitch at a time. Beautiful work. Love the detail and the way that you are also bringing the piece together with words and stitches. My favourites are the buttermints as well as they add a touch of grace and beauty to the design. 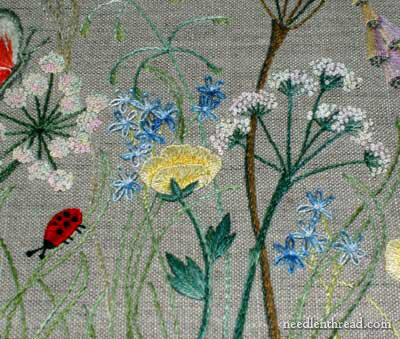 My answer comes years later but Queen Anne’s lace refers to the flower of the wild carrot or to cow parsley also known as wild chervil. Hope that helps, for the future. I love your website and I admire you for being able to tackle and finish such beautiful goldwork ! Wow ! Double Wow, I should say. Next Next post: August Embroidery Stash Give-away! It’s a Good One!